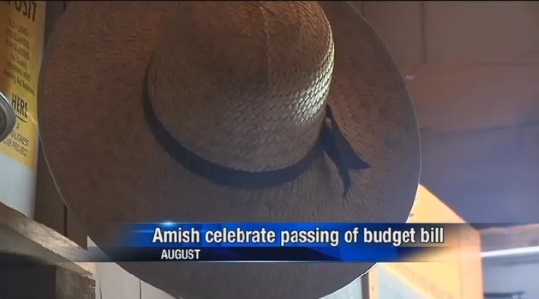 Amish in Wisconsin will no longer be required to install smoke detectors in their homes after a new exemption was signed into law last week. You may recall that Amish in Eau Claire County, Wisconsin had come into conflict with authorities after failing to secure building permits which would obligate them to install smoke and carbon monoxide alarms. Some Amish in the area had been evicted, while some had resorted to removing the detectors post-inspection to get around code requirements. The religious waiver also includes plumbing requirements exemptions. Update: Unfortunately the video embed has stopped working. You can view it at WQOW here. Smoke detectors arise as an issue among the plainest Amish groups from time to time when local building codes require them. Some object to use of the safety device as betraying a lack of faith in God. As a hint of how some feel, one Amish man described the technology as a “devil on the wall“. Another smoke detector conflict was resolved in 2012 in Morristown, New York after Amish and authorities came to an understanding that the detectors did not have to remain in the home after passing inspection. Another Amish legal conflict is playing out right now in Logan County, Kentucky. Amos Mast along with his son Dan were cited in April after violating an Auburn city requirement to have manure collection devices on their horses. The men refused to pay their fines, and after temporarily avoiding imprisonment, were heading to jail, according to the most recent report (July 9). Updates are lacking, but based on the info in that report, Amos Mast would serve a total of 20 days, with his son imprisoned for 10. The conflict, which we first noted here in 2014, has been ongoing for several years. This is the same area in which Amish faced legal troubles over refusal to use the orange buggy safety triangle in 2012. “Amish jailed after failing to pay their fines,” posted July 10 in Kentucky. At Yoder’s Dept. Store in Shipshewana, Indiana, where the horses and buggies park, is a designated exchange area where manure can be shoveled into from the parking lot, and landscapers and gardeners can get free manure. Saloma Furlong visited a library that was patronized by the Amish in the Lancaster, Pennsylvania area, and noticed they had a shed with barrels for that purpose. Thanks, Linda. The Mast jail story you shared looks at least a day fresher than the one I linked. I also found the following interesting. The community has been testing the bags, but feels they’re not the best solution, described below. While the Masts are in jail, members of the Amish community will continue to discuss the waste bag ordinance with Auburn officials. Joines said the Masts authorized him to pay the fines if the city will stop writing tickets for failing to have a collection device on their horses. Last week, the Masts tested waste collection bags on two of their horses, but Joines said the Amish community is still concerned about using them. Not only would the devices give the horses sores, but when the animals get spooked, “they just run wild and you can’t stop them,” Joines said. If the Amish agree to pick up the manure I do not see why they fine them sounds like politics and someone wanting to exert power to me. My mother used to “collect” manure from the rag man’s horse that would go through our alley in Chicago in the ’50’s & ’60’s, then put it on her garden. There were also horse & cart vegetable dealers in our neighborhood back then. I believe they picked up after their horses…or perhaps the city did. There weren’t that many horses then, so it wasn’t a big deal. They still have horses, I believe, in Chicago (police & tourist carriage rides). They’ve dealt with it somehow, and I can understand how the “manure collection devices” (!) would be irritating to the poor horses. Man makes these rules, and man can “adjust” them. Compromise is possible if both sides are open to it. I say, hooray for the city of Auburn! At least there is someone who is standing up for the rights of the citizens who find the sight of manure on public roadways unattractive! It is not the modern day culture to view animal excrement on public roads! Manure belongs in a pasture, not on asphalt! The Amish need to realize they are not the only ones who use these roads and that other people’s cultures need to be respected! Our roads are often used for more than just driving. People use the shoulders for daily walks, jogs, to ride bikes and other activities. The Amish should be respectful of the non-Amish cultures. After all you reap what you sow. With that being said, I repeat, Hooray for the city of Auburn! Now if only more city leaders would take notice! Maybe the Amish would realize, they aren’t the only ones who want their cultures respected! What a load of… manure. It may be “load of manure” to you but, to the people of the city of Auburn, they felt it was a big enough of deal that they put an ordinance in place. It surprises me that you would so blatantly disregard anyone’s feelings on this matter! Mark my words! As the Amish population continues to increase, this is an issue that will NOT go away! Sure it’ll go away. Manure is biodegradable!! Would you like to the documentation I have that refutes your claim? Because, I can show you proof that a rain storm does not in fact, immediately and completely erase the excrements of the Amish transportation! Fran, I don’t really need to see a picture. I have a pretty good imagination. All I was hinting at is that you might want to take a deep breath, relax, thank God you are living in a county where you are able to express your views and realize if horse “poop” in the middle of the road is the worst you encounter today, you are indeed a very lucky woman. I sincerely hope you, Fran, and all of our readers have a wonderful day. What good advice, Harriet! I hope you have a good day, too. Blatantly disregard anyone’s feelings on the matter? And you’re thinking of the Amish people’s feelings on the matter or the feelings of those who actually appreciate the Amish? You’ve made quite a few negative comments about the Amish on this site. I know they are not perfect and will agree there is room for improvement on BOTH sides, but it appears you simply dislike the Amish and will jump on the anti-Amish bandwagon even if it is involves something in a different state. You’re entitled to your opinion just like I am entitled to mine, but I’m rational enough to see the positive as well as the negative. You write the Amish need to realize other people’s cultures need to be respected yet you show no respect for theirs. Sad. 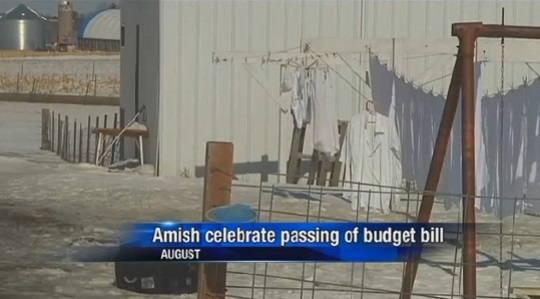 And after we get rid of the Amish, Fran, who shall we target next? People from countries we cannot immediately find on the map? Anyone whose skin is a different colour than ours? People whose religious beliefs conflict with ours? Gays? Pascifists? Vegetraians? Mentally or physically challened people? Those that live in trailers or mansions? Those who voted for Obama? People who leave their Christmas decorations up all year? Just what culture are you representing? Not mine… I’m an American who appreciates the diversity of our country and before you respond, I also live in an Amish area. Since the Amish moved here we have had issues to deal with, but they have been gracious in dealing with the short-comings of our own local people just like the local non-Amish people have been gracious in dealing with their short-comings. I’m proud of the way our area has welcomed them and I appreciate what they stand for. Stop calling it “respecting non-Amish culture” or “civic duties” and call it what it is: bigotry. You gave a great response William. READ the WHOLE ARTICLE !!!! The Amish clean up after the horses, they just don’t want a device on the animal that rubs and can cause severe abrasions to the horse, and SPOOK them with the rubbing on the horse’s legs. If you aren’t going to read the whole article, why would you make a comment that just shows your ignorance of the entire situation ???. And keep in mind that although manure may cause a smell , at least it’s not polluting the air with gasses. Let’s look at life with the glass half full, not half empty. We find what we look for. Good points, Rebecca. I always enjoy your contributions on here. Though I’m surprised they have the access and free time to do it. They must be motivated, and I’m glad they are. Amish Girl – Rebecca might be one of those smart-phone-using Amish mentioned elsewhere on this website! I have computer access at work and at 1 of my summer jobs I’m frequently bored, thus the free time to be on here. I’d rather be on here teaching folks the truth about my people, than being bored. And NO, I do not use a smartphone. I wouldn’t even if they were allowed by my church, which they’re not. Believe me once school starts you won’t hear too much from me. Because of my work at the Heritage Center I know how many misconceptions are out there about us, so if I can rectify that for even 1 person it’s worth my time being on here. I see it as a mission of sorts, though I wouldn’t allow it to take away from more important things : God time, family time, helping others, and necessary work. “Members of Milaca’s Amish community and city leaders appear to have found harmony [in Minnesota] when it comes to the issue of horse feces being left on city streets. …Amish elder Melvin Schmucker sternly told members of the City Council putting catch bags on their horses was not an option. After some discussion, Mayor Pete Pedersen and Schmucker agreed that the Amish would ride into Milaca in pairs with a bucket and shovel on their buggies. If a horse defecates, the buggy will immediately stop and one of its passengers will clean up the street. It may be helpful in relationships to listen and try to understand the other person’s point of view, even if you don’t agree. Forgiveness is good, too. I found this interesting. I know in our little PA town a lot of the non-Amish can be seen shoveling up horse manure from hitching rails and so on. It makes a great additive to gardens and flower beds!